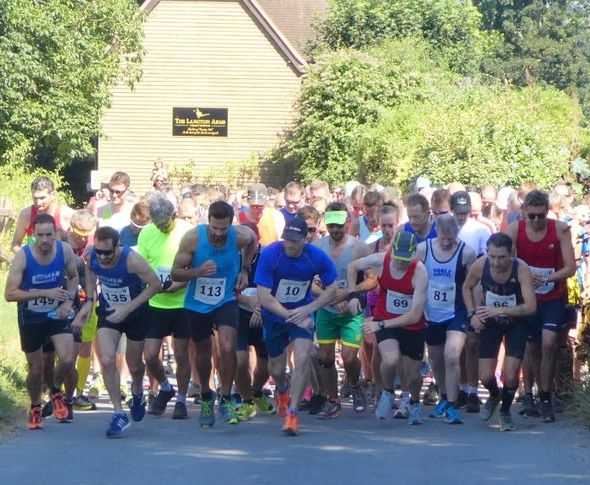 The Tarrant Valley 10 comprises a multi-terrain 10km race and a separate 1 mile children's race, hosted by the village of Tarrant Monkton, set entirely within the Cranborne Chase Area of Outstanding Natural Beauty. Both races start and finish in front of The Langton Arms pub right in the heart of the village. The 10km race begins on tarmac roads but, after the first kilometre and a challenging ascent into Hogstock Coppice, the course continues on well-surfaced bridleways and farm tracks. Relatively flat through Sing Close, Long Row and Calcott's Coppices, half-way is reached at Six Cross Ways in Chetterwood. Past Strawberry Coppice and a gentle climb to Launceston Wood, the course then opens out to deliver a quite spectacular view over the North Dorset countryside. An exciting 800m descent on Common Drove leads to the road once again and a 600m sprint through the village to the finish. Approximately half of the race is in shade. The 10km race begins at 10.30am, shortly followed by the 1 mile children's race. The prizes for the 10km race will be for the 1st, 2nd and 3rd male runner and for the 1st, 2nd and 3rd female runner. There will also be veteran category prizes, and others for the first under-20 runner and the first Tarrant Valley runner. A team prize will also be awarded; UK-affiliated teams, 4 runners to count including (at least) 1 female. A raffle, and refreshments including a BBQ, teas/coffees, ice cream and cakes will all be available at the start/finish area. The event is hosted on a non-profit making basis, with the proceeds going to good causes.